In retrospect, it seems hard to believe that 2010 was just two years ago. 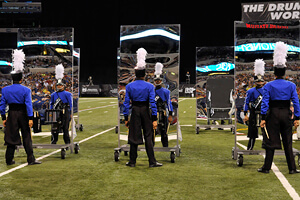 As the DCI World Championships returned for the second year to the familiar confines of Lucas Oil Stadium in Indianapolis, what may have been most unfamiliar to the audience was the music Blue Devils played during "Through a Glass, Darkly," one of my favorite shows of all time. However, that unfamiliarity was balanced by what was most familiar to the fans in the stands—hearing the corps announced in first place for the 14th time in DCI history, capping off two undefeated seasons with perfect scores in two of the three Visual captions. After World War II, bandleader Stan Kenton created a new ensemble to perform the most innovative music created not for dance halls, but for concert halls. Much of the music that resulted from this paradigm shift became known as Third Stream jazz, taking the idiom where it had never been and obscuring the line between jazz and symphonic music. Kenton premiered Bob Graettinger's "City of Glass" in Chicago's Civic Opera House in 1947 to a less than enthusiastic reaction, and finally recorded the work on LP four years later. Various incarnations of Kenton's Innovations in Modern Music Orchestra of 1950-1953 also recorded works by Pete Rugolo, who was chief arranger for Kenton in the post-WWII 1940s; Franklyn Marks, a Dartmouth College music professor better known as the composer of "Remember When" from the "101 Dalmatians" soundtrack; David Raksin, best known for the piece BD performed; and Johnny Richards, whose pop song "Young at Heart" was made famous by Frank Sinatra. The show is a bit of a challenge to write about, as the selections utilized were sometimes woven into the fabric of the show in such a way that they didn't show up just once. Rugolo's selections included "Conflict" and "Mirage," Graettinger's was "Incident in Jazz" and "City of Glass Suite" and Richards offered "La Suerte de Los Tontos" from "Cuban Fire! Suite." Marks' contribution was "Trajectories," and Raksin's "Laura" was the most well-known melody, written for the 1944 Otto Preminger film noir production of the same name, made into a massive pop hit the following year when Johnny Mercer set lyrics to the melody. Performance excerpt of the 2010 Blue Devils. The show started with the color guard members facing into and reflected by a long gentle arcing series of mirrors that, if straightened out, would have spread beyond 50 yards. This opening effect seemed to double the size of the guard. The horn line then poured out from behind the mirrors, further reflecting the guard's motions. When the drums and horns approached the mirrors, the size of the corps seemed to explode, playing with the heads of the audience members. The ethereal dreaminess of "Laura" was interjected with broken reflections of the now-displaced mirrors and some brass outbursts that captured the ongoing intrigue and danger that made the film so riveting. The sound of breaking glass then shocked everyone back into reality. For many in the audience, the ears started to be challenged somewhat uncomfortably at just about the exact midpoint of the show, when "Incident in Jazz" took over with its abstractly formatted fugal melodic lines, as challenging to follow as they were to listen to without shifting one's brain in overdrive. If you're convinced you're never going to enjoy this show, no matter how hard you try, you may wish to buy the DVD for no other reason than to watch the close-up of the fans right behind the drum major as they attempt to absorb some of the loudest, most intense brass playing I've ever heard. Their arms are crossed and the looks on their faces are of a mass disconnect. (This is immediately prior to the horns and drums forming the giant form of an eye.) It's a perfect metaphor for how audiences are still challenged to relate to this most innovative of Kenton music, six decades after it was written. A percussion break led into "City of Glass," and things didn't get any more comfortable for the ears of many fans from there to the end of the show. Melodically, up until the big contracting arc during a restatement of "Laura," and then afterward, the music became clashing and dissonant, careening off into many orbits at once, with a melodic center all but obliterated by the cataclysmic explosiveness of the multitude of simultaneous melodic lines. At the very end, to sounds of feedback, a drum major ran into members of the guard, who threw him behind a single segment of one of the mirrors. The sound of breaking glass was heard once again while the drum major appeared to come rolling out from behind another mirror several feet away, standing up and appearing as dazed as those members of the audience who may yet need a few more decades to lock into the music. For this week only, you can save on the World Championship DVD set that contains this complete Blue Devils performance, along with all finalists from the 2010 DCI World Championships. Buy the 2010 World Championship DVD set. (Available this week only for $63. Regular price: $79.) Discount DVD offer ends Monday, Sept. 10 at 8:30 a.m. ET.